The trend of this moment are the drones, multi-rotor copters and quad-copters. As is the case with all popular products, there are a lot of them, and each comes with its own set of lucrative offers and options. These gadgets vary in their price depending on the size and the features. There are many copters available at just $15. But one cannot expect to get a camera attached to it nor can expect it to have advanced features. Copters in a price range of above $100 have better control and better features. This Drone is not a toy copter. It is full of great features and excels in terms of specifications. The Quadcopter comes with a camera mount suitable for GoPro 3. The highlight of this drone is its Intelligent Orientation Control (IOC) which means that the drone can memorize its position. This agile Drone is easy to manoeuvre, but mastering this drone is a bit hard. The compatibility with Naza-M autopilot system is quite amazing. This drone with GoPro mount, once mastered (which can be done with a couple of hours of practice) can help in getting the first shots in no time. It is not tough even for a person with no prior experience. Let us review this product in detail. 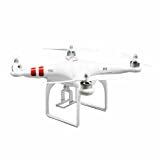 The DJI Phantom Aerial UAV Drone Quadcopter for GoPro is a perfect choice for people who want an affordable and easy-to-use copter with Camera. The only preparation required for operating this copter is to attach the rotors and include the battery. Design: The Copter is in the shape of a traditional ‘X’ with four rotors at the four ends. It is white in colour and has a camera mount in its undercarriage. The use of ‘X’ design is to provide a lightweight device but with a sturdy functionality.The Camera mount is simple and is compatible with all the GoPro Hero series cameras. The camera can be fixed in two ways – front or facing straight down. The mount holds the camera so firmly and there is no need to worry about the camera becoming loose during the time the copter is in air. Aerial Filming Device with a GoPro Mount:The mount is a GoPro mount which makes the filming process easy. This Phantom series has been constructed for supporting the filming using GoPro Cameras.It has been tested with GoPro HERO, Hero3 and Hero 3+ models (that are sold separately). Modes: There are essentially two important modes of operating this drone. One is the GPS mode, which is a unique feature. This mode is helpful for capturing events like sports.Also, new users can make use of this mode to correct the flight path of the drone if it goes astray. The other mode is the Attitude mode, which is nothing but the manual mode. This is enabled when the user wants to take full control of the drone.In the GPS mode, if the controls are let go, the drone hovers at the same spot. But in the Attitude mode, the drone keeps moving in the same side it previously was moving. The Attitude mode is essentially meant for advanced fliers who are very familiar with the operation of this drone. Intelligence Orientation Control (IOC): This is the most important feature of the Phantom Series. There is a switch in the device that activates this functionality. Once switched on, the flying pattern of the drone can be changed by the user.The usual movement of a drone is front and back, but with this switch, the drone can fly relative to a certain home point, thus making it more traceable. With this Autopilot feature, it can perform smooth, sweeping motions in a controlled fashion.The highlight of this feature is the ‘Return to Home’ function. If the copter loses the transmission signal, then it automatically come back to its home point. The Naza-M autopilot system allows the user to configure more advanced features and flying modes.Once the Attitude mode is learnt thoroughly, the Naza-M functions can be utilized for a fun-filled experience. GPS Positioning:With the help of advanced GPS positioning, outdoor flight is made possible with much less disturbance. Speed: The maximum horizontal speed of the copter is 22mph. If the user gets used to the joystick, then it is quite easy to manoeuvre. The speed is of great help when it comes to capturing sports, event or a quick scene. Every Gadget will have its own advantages and disadvantages. There are not many negative points to think of, in this drone. But here are a few that might as well be considered as a disadvantage by a few. The instruction manual that comes along with the package is not so easy to understand. It sometimes complicates the setup process. Sometimes, it requires a look up at the YouTube to understand things in a much clear perspective than look inside the manual.As an advanced gadget, the manual could have been better to explain the steps clearly. The battery for this copter is a rechargeable battery and requires a charge of approximately 90 minutes. But the flight time is limited to 15 minutes. Either the battery need to be recharged again or a spare battery should be in hand to continue the ongoing shoot. However, extra batteries for this drone is available at a cheaper rate! This point is a risk and doesn’t get termed as con. As this drone is quite expensive, this might not be suitable for beginners as they tend to crash the equipment. The spare parts for this gadget is also expensive and crashing it would lead to a loss in investment.It is better for beginners to buy a drone below $100, practice on the controls and then buy this gadget. The DJI Phantom model dominates the market and it is not for no reason. With every version of the Phantom model, there are new improvements and innovations on the way like the version 4 of this model having an obstacle avoidance system. For almost all the entry-level shoppers, the standard model of DJI is on rage in the best drone under $1,000 category. Here is why it is the most preferred Drone. The photographs and videos taken through this drone are stunning. This is because of the stability of the gadget while in air. The flight features are quite impressive and the drone moves faster than expected. It has the capability to fly extremely high. The software intelligence is something that is very special in this copter. It is advanced than other copters and the user can program advanced functions with the help of Naza Assistant Software (which can be downloaded and connected to the copter via USB). There is also a fail-safe configuration that can be done to make the drone fly back to its take-off position in case the copter loses the transmission signal. There are not many such copters in the market having such kind of an advancement. Connecting the GoPro models to the mount is very easy as this is a drone with gopro mount and this is one of the main reasons for people preferring this drone. There is no better model than the DJI Phantom Aerial UAV Drone Helicopter for GoPro. The stability, reliability and safety features are all quite satisfactory. There might be many models in the market having similar features. The DJI Phanton Aerial UAV drone with gopro mount, is a ready-to-fly type of gadget for ready use with much less effort on setup. Though not much suited for the beginners, they can still try it out using the GPS mode which assists them in a lot of ways. But this is a professional drone that excites the advanced fliers by offering a variety of functionality through Naza-M. This is certainly a “must buy” product.